You would think that when a horribly inaccurate book goes out of print that eventually it would just fade into obscurity...yet in the last week I have heard several different groups as well as people talking about Edain McCoy and her book Witta, which may be the single worst book on Irish paganism ever written. Ever. So I have decided to write a blog book review of it - although I will only be able to touch on the highlights of the errors in the book, as to address every single issue would take almost another book's worth of writing to do. Now moving on to the actual text, we encounter the first problem on the second page of the introduction where the author comments on the difficulty of reconstructing a faith that as she says "was forced underground and kept alive by small, secretive pockets of believers". This plays into the idea that paganism became the hidden faith that survived to modern times and is just waiting to be found by dedicated seekers - Margaret Murray would have loved this, but the reality is that this idea has been pretty well disproven. Traces of pagan belief and practice have survived as folk belief, and revivals began several hundred years ago with the upsurge in interest in the occult and paganism but there is no unbroken pagan line from the pre-Christian past until now. Next, also in the introduction, the author explains her passionate dislike of the Patriarchy - readers of the book may want to make a note of this, because you'll be seeing the word a lot as well as the author's opinion about how it ruined everything. Because apparently Irish Celts had a perfectly wonderful, peaceful, Great Mother Goddess worshipping matriarchy until the Druids and then the Roman Christians came along...but wait! you're saying, How could the Irish Celts have had a religion prior to the Druids, since we know that the Druids were the priestly class of the Celts and would have come to Ireland with Celtic culture? Good question. As McCoy explains it the Celts were the main ethnic group in Ireland up until the 2nd century BCE practicing Witta. Then in the 2nd century BCE the Druids came to power and ruled until the 4th century CE, except she then says that the Christians took over in the 2nd century CE. Good luck working out how any of that makes sense. The reality is that the neolithic people of Ireland certainly did have a religion, but we have no real record of what it was or how it was practied, only the barest hints that can be gleaned from studying the dolmens and other stone structures left behind. When Celtic culture migrated to Ireland, likely starting in the 5th century BCE, it mingled with and influenced the existing culture; eventually the Celtic culture came to be dominant, but it is impossible to say what the neolithic culture was like or what role the Druids played in the blending of the cultures. Ireland remained effectively pagan until about the 5th century when dominance shifted to the Christian church, so instead of the 400 years of Druids that McCoy claims it was more likely close to a millenia, and possibly longer since we don't know with certainty when the Druids finally ceased existing totally. McCoy really doesn't like the Druids and the book discusses at several points how the Druids ruined the Matriarchy and paved the way for Christianity. She also blames the Druids for first starting to drive Witta underground as the Druids sought power by cutting the people off from the gods (more on the gods later) and trying to control all knowledge. Of course she also claims the Druids were a secret society and I still haven't worked out how she thinks they could have been a secret society and a powerful priestly class at the same time - it's kind of like saying Roman Catholic priests are a secret society, or Jewish Rabbis, or for that matter like saying that modern doctors or lawyers are part of a secret society. The reality is that the Druids were a powerful class in Celtic society and they did act as priests, doctors, lawyers, and teachers but anyone could seek training as a Druid (according to Caesar) so it was hardly a secret society. She also mistakenly refers to female Druids as "Dryads" and claims they were named so after the Irish tree spirits. In reality the Old Irish for a male druid is drui and a female is bandrui (modern draoi and bandraoi) while Dryad is strictly a Greek word for a type of tree spirit. To further her evils-of-patriarchy theory she asserts that male Druids were supported and trained full time but the poor female Druids were forced to support themselves while training and take whatever instruction they could manage to fit in. She also claims that the Druids conjured the spirits of the dead in magical circles, used a form of divination based on their 13 month tree calendar, taught that to kill a snake was bad luck, and used the 4 classical elements, which is all non-sense. There is no evidence of the Druids using modern ceremonial magic style workings to talk to the dead and it's been pretty thoroughly proven that Robert Graves created the 13 month tree calendar and assigned each tree to it. There haven't been snakes in Ireland since before the last ice age, so it's impossible for Irish Druids to have kept them as totem animals or to prohibited killing them in Ireland. And while the Irish likely did have a system of elements it didn't involve the number 4. The vast majority of the religion contained in the book is basic Wicca: a black handled ritual knife, a wand - although she suggests replacing it with a staff which she calls a shillelagh - a pentagram. All the 8 Wiccan sabbats, the 4 elements, circle casting, etc., sometimes with a twist to make it a little different, sometimes pretty basically Wiccan, but none of it reflecting any kind of genuine Celtic or Irish beliefs. Now when it comes to gods McCoy gets very odd throughout the book. She does, of course, claim that Wittans believed in the maiden-mother-crone goddess (another Graves invention from 1948) but she assigns the maiden spot, apparently, to Danu, mother to Brigid (although she also says Danu and Brigid are names of the same goddess) and crone to Badb, who she later calls both Macha and the Cailleach. The god of Witta is the horned god called Cernunnos, which McCoy claims is a Greek name, although in reality it is Romano-Gaulish. She also mentions Lugh as the archetypal Wiccan son-lover-consort god to her Wittan goddess. Now at least so far she has referenced actual deities, even if she gets creative with who they are to fit them into her system. Where it gets really fun is when she starts making up gods. For example she talks about the ancient Irish goddess Kele-De, a goddess worshipped by women in opposition to the Church. And she also talks about the god Beltene, a god of death who was worshipped at Beltane. I'm sure everyone reading this knows that neither of those deities exists outside of the pages of this book. It's possible that her goddess Kele-De may be a bizarre twist on the Celtic Ceili-De or Culdee tradition, but how she got from one to the other totally baffles me.The name Ceili De means spouse or companion of God and was a Celtic monastic order of Christians, as I understand it, which doesn't translate well to an alleged pagan goddess. I did find an obscure reference by a Victorian anthropologist to the god Beltene, written in the late 18th century, which is obviously purely speculative and based on the antiquated idea that if Samhain was ruled by the -also fictitious - death god Samhain then the corresponding holiday of Beltane must also be ruled by a similarly named death god. I can't find the original but it is referenced here in the text under Beltane - the original was much more entertaining. Seriously. 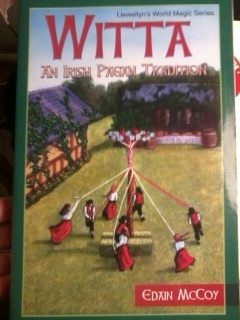 This book could not be worse if someone were intentionally trying to parody Wicca with an Irish twist. If you are drawn to a modern style of Irish paganism or to Irish flavored Wicca read Jane Raeburn's book Celtic Wicca or Lora O'Brien's Irish Witchcraft from an Irish Witch because both are better researched and written than this and could be used in modern practice. If you see Witta available for sale, buy it to keep it away from anyone who may read it and believe any of it and need deprogramming later. The Great Wittan Irish Potato Goddess will thank you for it. This blog post is based on a note I wrote on Facebook, inspired by a dream a friend had...no really ; ) It's mostly just for fun because everyone could use a little fun once in awhile. If Odin and the major arcana of the tarot were co-ordinated, based on Odin's many bynames.